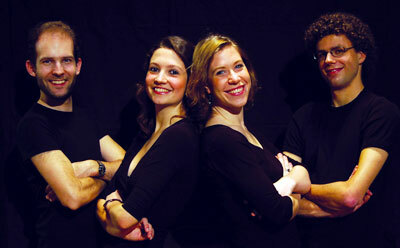 The Amaryllis Quartet won first prize in the quartets division of the Melbourne International Chamber Music Competition. The Swiss–German quartet also took the overall grand prize. The Kelemen Quartet from Hungary took second prize and received the Musica Viva Australia Prize and the audience prize. Third prize went to the Attacca Quartet from the US.In the piano trios division, Trio Rafale from Switzerland took first prize. Second prize went to the Rhodes Piano Trio from the UK. Trio Paul Klee from France received third prize and the audience prize. via The Strad – Amaryllis Quartet wins in Melbourne – 18 July 2011. This entry was posted on Monday, July 18th, 2011 at 3:28 pm	and is filed under Fiddle news and fun. You can follow any responses to this entry through the RSS 2.0 feed. Responses are currently closed, but you can trackback from your own site.